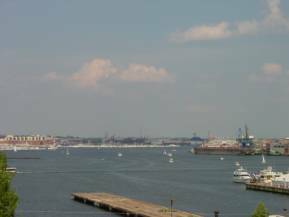 .....As you proceed past the Armistead Monument round the northeast corner of the Park’s perimeter and again pause to enjoy the panoramic vistas of the Inner Harbor east beyond Fells Point out to Canton and south to Fort McHenry and the Key Bridge. These latter views are now all threatened by a slew of commercial real estate development projects already approved by the same City officials and brought to you by the same builders who are responsible for the pink, phallic-like high-rise that now obliterates the views of Locust Point and the harbor to the southeast. Sadly, the battle against creeping commercialism is likely to be the first battle ever to be lost in the war to preserve the historic beauty of Federal Hill that millions have enjoyed for over two-hundred years. Unless you spread the word! Help Save Federal Hill Park!